This 81mm astronomy binocular delivers crystal clear, sharp views through its new optical design. 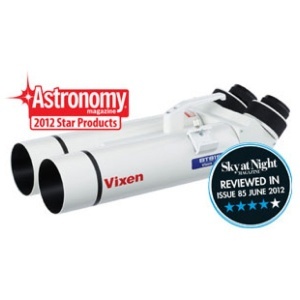 Its lightweight body ensures that you can take it to any observing location. The air-spaced doublet optics in this 81mm are magnesium fluoride coated to help reduce the effects of chromatic aberration. Mounting the binoculars is a simple process as they come supplied with a Vixen dovetail mounting bar for use with equatorial or altaz mounts. The dovetail bar also has 1/4" thread sockets for use with conventional tripod panheads. An optional altaz fork mount is available and allows the binoculars to be used on the optional SX-HAL130 or SXG-HAL130 tripods. These provide a stable but lightweight tripod base for this excellent "space binocular".